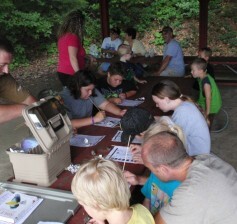 Earlier this month, the Wythe County Department of Parks and Recreation hosted a day long environmental education event aimed at providing local children opportunities to experience the thrills of the great outdoors. Participants, all of whom were under the age of sixteen, were treated to multiple hands-on lessons taught by many of the region’s premier outdoor teachers. Instructions included lessons in archery, casting, BB gun shooting and safety, and reptile identification. The event, hosted at the Rural Retreat Lake, was the first of its kind and was sponsored in part by the National Wildlife Turkey Federation. This morning, the Wythe County Board of Supervisors made the unanimous decision to dissolve the Lead Mines Rescue Squad. Virginia Code §27-10 provides that the governing body of the county may dissolve a fire or rescue (EMS) company for any reason it deems advisable. The decision comes after numerous reports of inefficient service, including multiple failures to respond to the emergency requests of citizens. In addition to having multiple concerns as to the squad’s management and business plan, E-911 records reveal that the department failed to respond to a total of 18 calls between the dates of July 1 and August 12, 2013. As the last major portion of Wythe County’s Speedwell Waterline Extension project steams toward completion, construction crews are now tackling many of the project’s greatest obstacles, including crossing the winding stream, known as Cripple Creek. 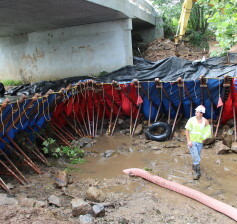 Beginning their work on Monday, construction crews from Central Builders and Cherokee Construction worked to build a cofferdam around the north bank of the brook, just inside the community of Speedwell. After a cofferdam was successfully constructed, crews pumped the dammed area Tuesday morning and then proceeded in digging a trench three feet below the creek bed. Workers then installed the waterline along the northern section of the creek, before encasing the pipe in concrete. Members of Wythe County’s emergency services were honored this past Saturday at the newly opened Wythe County Emergency Services Building, located in Fort Chiswell, Virginia. 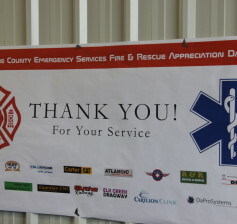 The event, dubbed “Wythe County Emergency Services Fire & Rescue Appreciation Day,” was the first of its kind and featured dozens of door prizes, a catered meal and additional gifts for all in attendance. Organized by the Wythe County Administrator’s Office, at the request of the county’s Board of Supervisors, invitations were sent out to all six of the county’s fire departments, as well as the county’s three rescue squads. 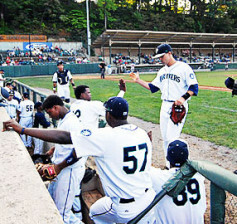 Click Here to Win Four FREE Pulaski Mariners Tickets! The Wythe County Public Information Office is giving away four FREE tickets to attend any remaining home game of the Pulaski Mariners! The winner will be drawn on Thursday, August 15, 2013! Step 1. Like Wythe County on Facebook! Step 2. Share This Contest With Your Facebook Friends! Step 3. Register Your Contact Info!